The Papal Basilica of St. Paul Outside the Walls (Italian: Basilica Papale di San Paolo fuori le Mura) was founded 17 centuries ago. It is one of the 4 major papal basilicas in Rome. Numerous parishioners and pilgrims flood into the church to receive absolution during the ritual of Holy Door opening. Since 1980, the church joined the World Heritage list. The Papal Archbasilica of St. John in the Lateran (Italian: Arcibasilica Papale di San Giovanni in Laterano). In 67 AD, the Apostle Paul (Latin: Paulus) was subjected to numerous tortures and executed as a preacher of the new faith by the order of Emperor Nero. The Christian apostle was buried three kilometers away from the place of his death, and the grave was marked by a memorable sign. Afterwards, this area of Rome was called St. Paul at the Three Fountains (Italian: San Paolo alle Tre Fontane). According to the legend, after St. Paul’s has been decapitated, and his head bounced three times to open the way to three underground springs. 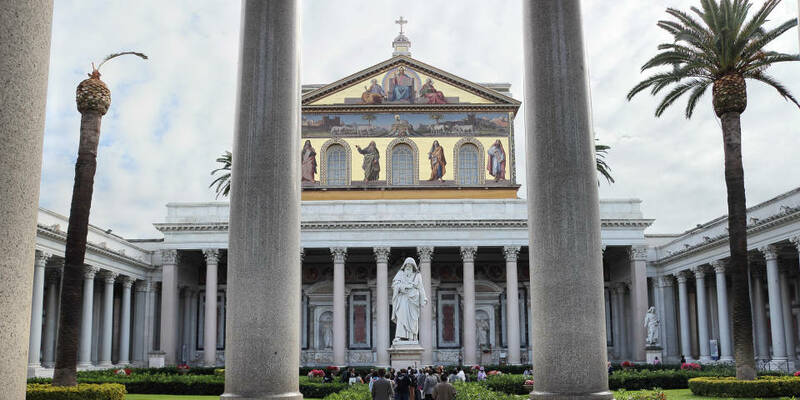 St. Paul Outside the Walls impresses with its grandeur and solemn appearance. The poet Prudentius’ poem written in honor of Emperor Honorius, immortalized the beauty of the holy place in the poetic form. 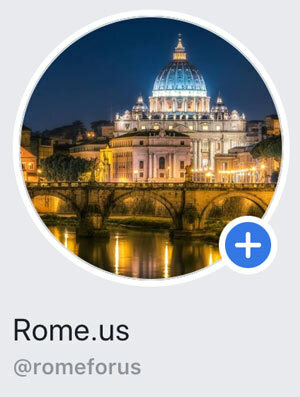 The picturesque basilica is located outside the Aurelian Walls that is formally past the boundary of Rome regarding to the standards of the early Christian era. The Porta San Paolo (San Paolo Gate) is a part of another memorable place – the wall, outlining the boundaries of the capital. It is believed that the Apostle Paul had to go for execution exactly from this spot. From the gate, there is a road to the south at the end of which St. Paul’s outside the Walls stands. 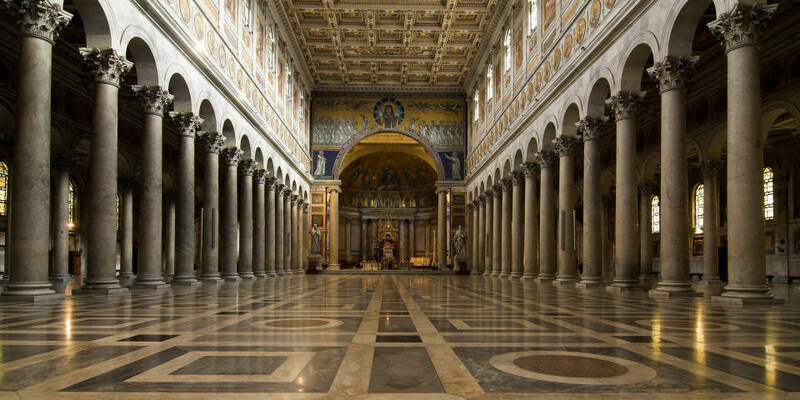 The basilica was built above the tomb of St. Paul in Rome, executed at the beginning of our era. Originally, many believers came to the tomb, so it was decorated with a memorial stone. To honor the memory of the apostle, Emperor Constantine I erected the church in the 4th century AD. Valentinian I expanded the construction and Theodosius I made it really beautiful. In 590-604, Pope St. Gregory the Great changed the church again: he built a new altar, decorated the yard with more than a hundred columns. In the center of the outdoor yard, they raised a monument to St. Paul holding a big book and a sword. It is made so realistic that having looked at the saint, you will understand – he was ready to give his life for the Christian faith. The church got its first damage in the 9th century during the Saracen attack, and in 1823, there was a big fire. 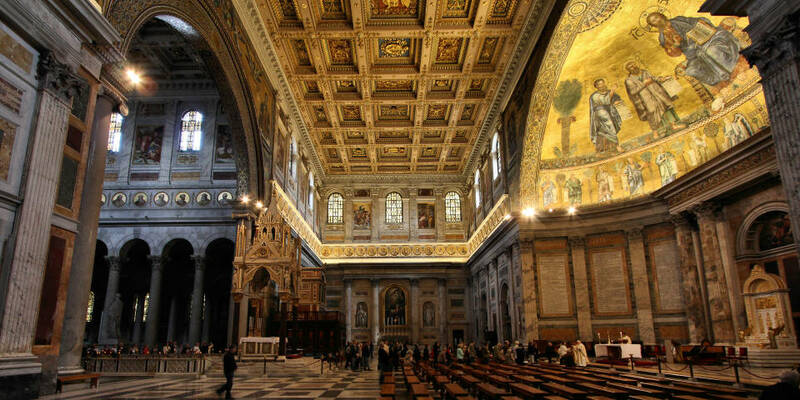 31 years later, it was rebuilt and Pius IX himself consecrated the place with the help of the whole Christian world. 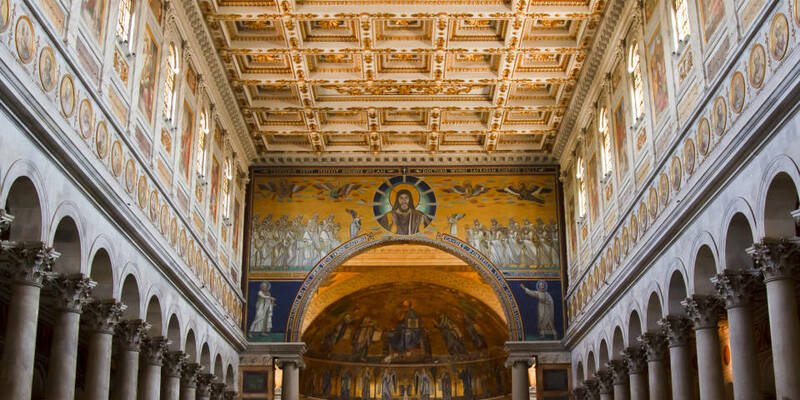 The cathedral was decorated with a new facade, frescoes and mosaics depicting St. Paul, Jesus and the Major Prophets. 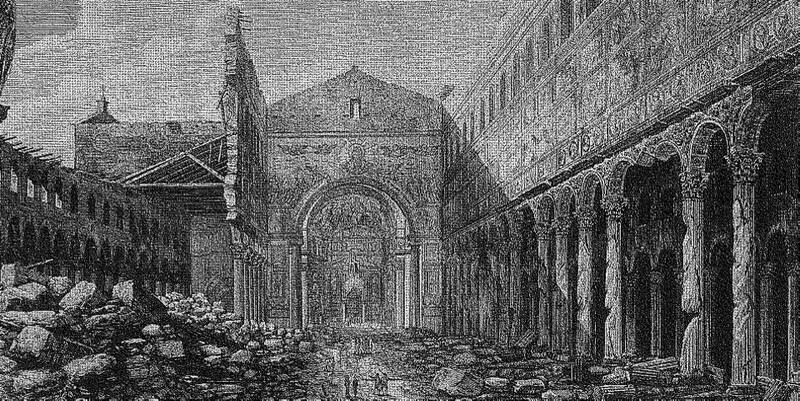 In the 13th century, the monastery at the basilica in Rome was dedicated. Outside, St. Paul outside the Walls resembles an ordinary fortress, but the main decorations are inside. The interior of the cathedral is rich adornments of the classicism and neoclassicism styles. In the basilica, there are three doors each of which is individually decorated. Remains of ancient entry sheets, dated from the 19th century, found their place in the right door, close to which you can see an image of Christ’s resurrection. Inside the cathedral, there are 5 rooms, the central one is divided by 80 granite columns. A colonnade and ceiling frescoes date back to the 19th century. The ceiling is decorated with carved gilded panels. The church also preserved a part of the 5th century construction – fragments of mosaics and the triumphal arch. One of the names of the arch is Arch of Galla Placidia. It is believed that it was erected in honor of the wife of the Roman emperor. Each window has a unique pattern, through which the sun comes in and fills the cathedral with warm light. The floor is paved with pictures of various animals. The gallery of St. Paul outside the Walls keeps 236 portraits of the pontiffs. Now, almost all medallions are filled. There is a legend that when the last Pope dies and no empty medallion is left, the world will come to an end. 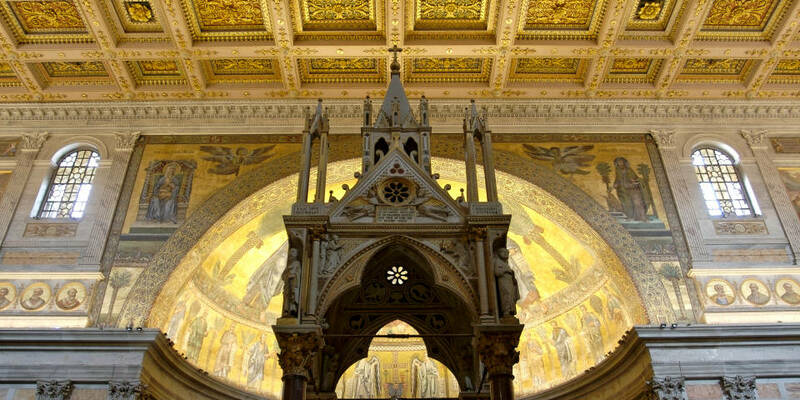 In the center of the church, visitors can see a sarcophagus with the relics of St. Paul – its main attraction. Above it, the tabernacle of 1285, decorated with skilfully combined pagan and Christian motifs, rises. And next to it, there is the candlestick of the 13th century with the height of 5.5 meters (18 ft). The right to celebrate mass here belongs only to the Pope. The tomb has holes used by visitors to put a piece of cloth into, in order to touch the holy place. Near the sarcophagus, there is an altar with a small window that allows anybody to make a confession. relics of the bishops, apostles, martyrs. In 2011, the cathedral hosted the 10th International Festival of Sacred Music (Italian: X ° Festival Internazionale di Musica ed Arte Sacra). Within the holy walls of the church, a symphony orchestra performed Anton Bruckner’s Symphony №7. Bus: № 23, 769, 792 (bus stop: Via Ostiense-San Paolo), №128, 669, 776 (bus stop: Baldelli). Opening hours: daily from 07:00 a.m. till 06:30 p.m., the monastery and the cloister are open from 08:00 a.m. till 06:15 p.m., confession are made from 7:00 a.m. till 12:30 p.m. and from 04:00 p.m. till 06:30 p.m. Ticket price: entrance to the basilica is free, the monastery and the cloister is € 4,00 (reduced € 2,00). St. Paul outside the Walls is located in the southern part of the city, two kilometers away from the Aurelian Walls. You can visit the cathedral either taking a guided tour or on your own. They create the most comfortable conditions for tourists, even provide with wheelchairs and allow blind people to take a guide-dog. At the entrance to the St. Paul outside the Walls, there are shops with souvenirs.